If I’m no longer a mother, then what am I? It’s a question I hear often after an adult child’s estrangement. Among the more than 9,000 mothers who have answered my survey for parents of estranged adult children, or reached out in site comments or in emails, hundreds ask the same or a similar question. Even the busiest mothers go out of their way for their adult children. Sometimes, mothers even say their lives revolved around them, as if they’ve been on-call. For some, the question has layers of complexity that make the situation even more heartbreaking. Like when grandchildren are involved, which makes the loss even more cruel and sad. Grandmothers picture the sweet, innocent faces of the grandchildren their estranged son or daughter has ripped away, and worry what awful picture is being painted about them. That they’re crazy? Or worse, that they don’t care? Those women may ask, if I’m no longer the devoted grandmother, always there and ready to help, then who am I? 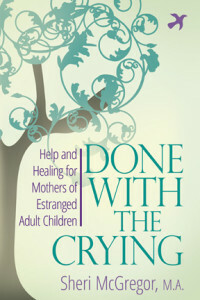 One of the many tools in my book, Done With The Crying: Help and Healing for Mothers of Estranged Adult Children, can help you answer that question. While answering doesn’t change the situation, it can change you. When we change, everything changes—for the better. Maybe you’ve been a mom that puts everyone else first. Maybe after an adult child’s estrangement, when that part of you seems stripped away, it’s hard to remember who you even are. You can figure that out again. You can find your very essence—and use that knowledge to move forward in your life. In my book, you’ll have the opportunity to reflect on what it is that makes you you, and even embrace parts of yourself you’ve never given yourself credit for. When we know who we are, we’re stronger. We’re better able to weather the storms of life, and the disappointments caused by the people we’ve felt so close to. As Mother’s Day approaches, with all the television commercials, and the families around you that seem so happy, it may feel like you’re all alone; like you’re the odd woman out of all the joy and love that fills the day. But you can reclaim your happiness. When you remind yourself of who you are, at your very core, you become your own guiding light—to a meaningful and fulfilling life. Join the ranks of mothers who recognize the gifts they have given. Applaud yourself, even if your children don’t. It’s not your fault they don’t recognize the love you’ve shown. Right now, recognize and honor yourself. You, too, can be done with the crying. Get help and healing. Move forward in your own fulfilling life. Available through popular booksellers–ask your local bookstore to order it for you (but prepare for delays–it’s so new it might not show up in their system yet!). Or order online. This entry was posted in Answers to Common Questions, Latest Posts, What Parents Can Do and tagged Mother's Day on May 3, 2016 by rparents. Thank you, Rainbow! I sincerely hope it will be of help to you. Post back and let me know if you like it (and post an Amazon review if you feel up to it). As you know, I have run this site for a few years now, with the aim of helping other parents to heal. If the book can reach even more parents of estranged adult children, and assist them to get beyond the emotional pain and move confidently forward, then all the work will make feel satisfied. Virtual hugs, to you and all the mothers and fathers who are hurting from an adult child’s choices. Thank you. I so want your book. I’m dreading this Mother’s day, my first without her. My first too. So so sad. This is worse than Thanksgiving, Christmas and Easter combined. I was estranged from my daughter for about 9 years before I healed. I can tell you that there is life after the pain. I spent many, many days crying until one day, I asked the Lord why am I still crying over this? God answered my cry and told me because you are not healed. I asked the Lord from that day forward to heal my broken and damaged heart, and He did. I have access to our grand kids now but it was a long time coming. The relationship I have with our daughter is slowly mending. The estrangement of a child is an awful awful hurt and what makes it even worse is when you did absolutely nothing to cause it. The lack of power you feel, being powerless in that moment is devastating. The pain you feel that says, “my child did not choose me” is sickening. This October marks the end of year three. I am in therapy for “complicated grief” and only in the past 6 months have had relief from the recurring bouts of weeping. I welcomed your much needed book and found it very helpful. Most difficult is that I am 70 and don’t feel I have the 9 years Darlene had to heal, or many years to be an active grandma to my only grandson, even if there is future mending. I am trying to reinvent/re-remember my former self in order to enjoy my elder years. There are good and bad days. I still am devastated. I still feel hurt going into the third year now! I read articles,and I do volunteeer work,but I still feel a void. I try to be happy, but I feel lots of ups and downs now! It is almost a year since my daughter has talked to me, I am not looking forward to Mothers Day, in fact I dread it. I know I will not hear from my daughter. I will make the best of it by spending time with my husband and my mother in law, and try to be good to myself because I deserve it! August will be one year since I last saw my daughter,but the stress began to mount last May. I’ve lost 25 lbs trying to understand how one of my children just cut me out of her life. She also cut the rest of the family as well as friends I spent a lot of days in bed just crying. I never knew just how much a body could cry. I’d say I started forcing myself to function a few weeks ago. 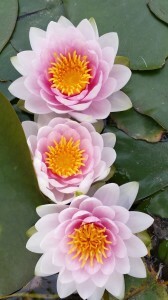 I love gardening and I’ll have the best gardens in the zip code because that’s where I’m focusing my attention. I just miss my baby girl, my best friend.